Available in a variety of sizes, stocks and orientation, our stapled booklet range is perfect for delivering a vast amount of information. (130gsm Gloss, 150gsm silk, 120gsm Uncoated & our new 115gsm silk with a choice of Self Cover, 250gsm silk or uncoated covers. 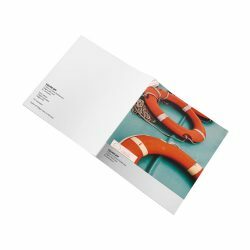 Portrait; Our portrait stapled booklets come in three different sizes with plenty of choice on quantity and number of pages. Available in paginations of 8pp to 56pp and printed using Gloss, Silk or Uncoated stock, they’re saddle stitched down the long edge and come with the option of a thicker cover. Landscape; Our landscape stapled booklets come as either A4 or A5 with lots of choice on quantity. 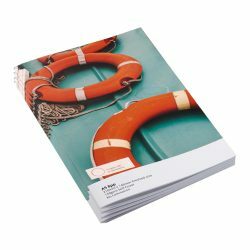 Available in paginations of 8pp up to 56pp, they’re saddle-stitched down the short edge and printed on Silk, Gloss or Uncoated stock with the option of a thicker cover. 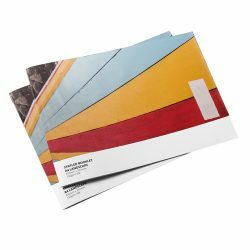 Square Booklets; Our 210 x 210mm square stapled booklets can be printed using Silk, Gloss or Uncoated stock, with the number of pages ranging from 8pp up to 56pp. With huge choice on quantity and the option of a thicker cover, they’re ideal for clients who want to stand out. In regards to stock, you can choose from Silk, which has a slight sheen and smooth finish; Gloss, which offers high shine and vibrancy; Uncoated, which is perfect for writing on. We use a combination or digital and litho methods to allow us to give you the best price we can. As a general rule of thumb, print runs up to 1000 are printed digitally while runs above 1000 will be printed litho. Please note that booklets are generally zero-rated for VAT, however if your artwork is liable for VAT we will inform you of this on sight of your artwork.